Over 56,000 Waverley and South Head Cemetery Transcriptions have been added to the Life Events (BMDs) category on our website. These cemeteries in Sydney's eastern suburbs began in the 1800’s. 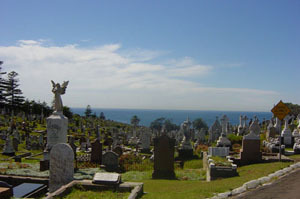 Waverley Cemetery had its first internment in 1877 now has now grown to over 80,000 interments in 50,000 gravesites and memorials over 40 acres. South Head General Cemetery had its first internment in 1869 and now has over 6,000 gravesites and memorials in 4 acres. These records include the full details transcribed, and also denomination, section, row and plot number. Nearby graves are also listed. These records are really valuable for anyone searching for ancestors from the Waverley and South Head areas.